The new office of the Russian Federal Agency for Humanitarian Co-operation, opened in London, is expected to promote the Russian culture in Great Britain and strengthen Russian-British ties. In March, I participated in a landmark event: the opening of the new office of the Russian Federal Agency for Humanitarian Co-operation (Rossotrudnichestvo) in London. While it is not a fully fledged cultural centre (there is no agreement on cultural centers between Russia and UK), it has extensive facilities: a large exhibition hall, a library and multimedia classes where Russian will be taught to adults and children for free. Rossotrudnichestvo , at 37 Kensington High Street, is set to become a top venue for Russian cultural events, in London, joining forces with Pushkin House in Bloomsbury, Academia Rossica at Piccadilly Circus and all the other Russian charitable associations that are based here. It has opened just in time for the London Olympics and for a series of forthcoming anniversaries of important events celebrated in our shared history. This year, we celebrate the 200th anniversary of the victory of the Russian people over Napoleon’s invasion force in 1812, which provided the inspiration for War and Peace by Leo Tolstoy. 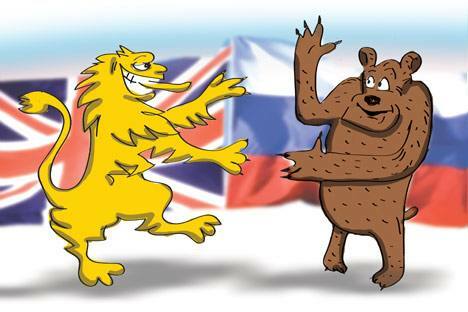 Russia and Britain were allies in that war and their joint actions in different places of the European continent were a success to be remembered. 2013 will mark the 400th anniversary of the Romanov dynasty. The Romanovs were closely linked to the British Royal Family, which makes it proper to bring to light many historical details which look almost forgotten now. 2014, in turn, will be a sad anniversary – the centenary of the onset of the First World War. The conflict, in which UK and Russia were allies once again, had a lasting impact on European civilisation. In Russia, it was long overshadowed by the 1917 Revolution, which was brought about by that war. Only now are tributes being paid to the heroes of the Great War. These events along with other blueprints for co-operation were discussed in March by the special representative of the Russian president for international cultural co-operation Mikhail Shvydkoy during his talks at the Department for Culture and the British Council. We know how much Russian culture is appreciated in Britain: every tour of the Bolshoi and Mariinsky Theatres or the Alexandrov Choir is a roaring success. Russian stories and events have provided the inspiration for plays by Tom Stoppard and John Hodge, and the recent BBC version of Vasily Grossman’s Life and Fate . However, I would like to encourage my British friends to take a closer look at some of the contemporary Russian arts where the great traditions are present. Renowned modern Russian writers come to the London Book Fair every year; every November a Russian film festival is held in London; exhibitions by contemporary artists are frequent; early in April, the Eifman Ballet brought to Britain the best of Russian contemporary dance. The cultural attraction is certainly mutual. Russians are familiar with many of the characters of British literature, literally from birth, and some authors, such as Somerset Maugham, seem to be better known in Russia than here due to the excellent translations of their work. The Shakespearean anniversary in 2014 will be almost as great an event in our country as it will be in Britain. Art from Britain is always met with open arms in Russia. The importance of these links was underlined by the leaders of our respective countries, President Dmitry Medvedev and Prime Minister David Cameron. One of the two documents adopted during Mr Cameron’s visit to Russia last September was the statement on cultural co-operation. It reiterates state support for major joint projects and encourages new ones. There is more than a humanitarian dimension to our cultural contacts. The links nurtured by them are the most durable, because they promote better mutual understanding and they are most resistant to turbulent political climates. This was proved, for example, by the success of the exhibition From Russia at the Royal Academy in 2008. There is a great appreciation of Russian art and history in Britain, while the same has always been true in respect of British culture and history in our country. Thus, cultural ties defied the political conditions of the day, keeping our nations in close touch. It is worth mentioning that the cult classic Lord of the Rings was first published in the Soviet Union as a children’s story. Now, with the Cold War over, the level of people-to-people contacts is incomparable, though I frankly believe that Britain should look to continental Europe’s experience of easing visa restrictions with Russia. The agreements in place between Russia and the EU ensure minimal formalities for cultural, educational and humanitarian exchanges. We want to avoid situations where concerts or exhibitions are cancelled because of visa problems, and we’ve had lots of success in that area with other countries. But even if the politicians lag behind men of culture in establishing firm links, our mutual cultural attraction is a factor that makes the sometimes bumpy bilateral relationship more stable. We need to get to know each other better to achieve better co-operation, and culture helps us to better understand each other.